If you grew up watching “Mister Rogers’ Neighborhood,” some of the voices in this week’s podcast will bring back memories. François Clemmons was singing in a Pittsburgh-area church when he first met Fred Rogers. Taken by his voice, Fred asked François to join the cast of his new television show as singing policeman Officer Clemmons. He would go on to play the role for 25 years, becoming the first African American actor to have a recurring part on a children’s TV show. Initially, he was uneasy about taking on the role of Officer Clemmons, having personally had negative interactions with the police, and having witnessed the violence civil rights demonstrators had faced at the hands of law enforcement. But a scene from a 1969 episode of the show helped convince him that his role would have a positive impact on society. During the show, Mister Rogers invited Officer Clemmons to take a break from his work walking the beat and join him in a kiddie pool to cool his feet. As the scene concludes, in what is clearly a biblical gesture, Fred, who was also a Presbyterian minister, takes a towel and dries Officer Clemmons’ feet for him. Twenty-five years later, they reprised the scene during François’ final appearance on the show. François and his friend, Karl Lindholm, came to StoryCorps to discuss how he became the friendly singing Officer Clemmons, and his relationship with the man known to children as Mister Rogers. Fred Rogers’ friendship and kindness stood in contrast to other scenes involving swimming pools in the 1960s. Our second story is about an incident that took place at a segregated pool in June 1964 in Saint Augustine, Florida. 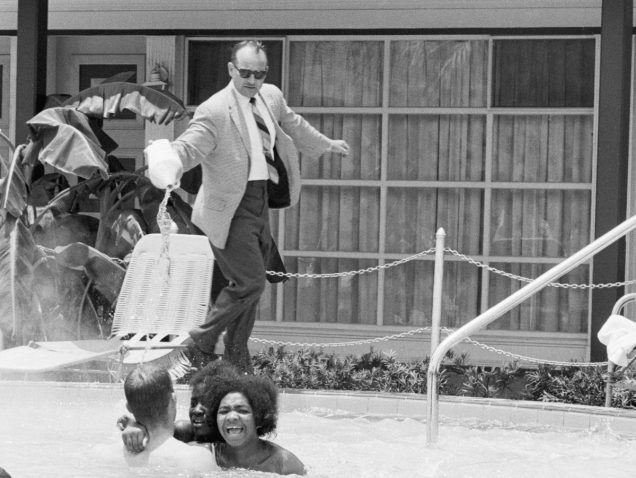 Black and white protesters staged a “wade in” at the “Whites Only” pool at a place called the Monson Motor Lodge. J.T. Johnson and Al Lingo were two of the protesters and they came to StoryCorps to remember how the owner of the motel tried to force them out of the pool by throwing acid into the water. The producer of both of these stories is Jasmyn Belcher Morris, and Cailey Cron fact-checked the François Clemmons piece for StoryCorps. They both join the podcast this week to provide some history and context to the professional and personal relationship between François and Fred. Additionally, François had a Grammy Award-winning career as a singer and was an artist-in-residence at Middlebury College in Vermont where Cailey, a graduate of the school, came to know him as a man about campus. Michael Garofalo (MG): This is the StoryCorps Podcast. I’m Michael Garofalo. And joining me for this episode is Jasmyn Belcher Morris. Hey Jasmyn. Jasmyn Belcher Morris (JBM): Hi, Michael. MG: So, we’re in the middle of this presidential primary race, and it just feels like we’ve been hearing nothing but screaming and yelling lately. But for this episode, you’ve brought us some quieter, gentler voices. JBM: Yeah, that’s for sure. Actually, you might remember these voices from growing up. François Clemmons played a character on “Mister Rogers’ Neighborhood,” for 25 years. And it started one day, when Fred heard François singing in church. And in 1968, François joined the cast of the show. JBM: Yup! And at StoryCorps, he told a friend about how he became Officer Clemmons. François Clemmons (FC): Fred came to me and said, “I have this idea, you could be a police officer.” That kind of stopped me in my tracks. I grew up in the ghetto. I did not have a positive opinion of police officers. Policeman were sicking police dogs and water hoses on people. And I really had a hard time putting myself in that role. So I was not excited about being Officer Clemmons at all. There was one particular scene that Fred and I did, where he had his feet resting in this plastic pool on a hot day. Oh, there’s Officer Clemmons. Hi, Officer Clemmons. Come in. Hi, Mister Rogers, how are you? And he invited me to come over and to rest my feet in the water with him. Would you like to join me? OK, sure. The icon Fred Rogers, not only was showing my brown skin in the tub with his white skin as two friends, but as I was getting out of that tub he was helping me dry my feet. There, that one’s dry. Thank you. And so that scene touched me in a way that I was not prepared. Sometimes just a minute like this, will really make a difference. I think he was making a very strong statement. That was his way. I still was not convinced that Officer Clemmons could have a positive influence in the neighborhood and in the real world neighborhood, but I think I was proven wrong. Karl Lindholm (KC): You were on Mister Rogers’ Neighborhood for a long time. FC: Yeah, I discovered a friend for life. I’ll never forget one day I was watching him film a session. And you know how at the end of the program he takes his sneakers off, hangs up his sweater and he says, “You make every day a special day just by being you, and I like you just the way you are?” I was looking at him when he was saying that, and he walks over to where I was standing. And I said, “Fred were you talking to me?” And he said, “Yes, I have been talking to you for years. But you heard me today.” It was like telling me I’m OK as a human being. That was one of the most meaningful experiences I’d ever had. I’m so proud of you, François. Oh, thank you, Fred. Do you have time to give a song to my friend and me? I sure do. JBM: Yeah, and this song is actually from the second time they did the scene. The first time was 1969, and then they did it again in 1993, for Officer Clemmons’ final appearance on the show. MG: Okay, so we have to talk about something,– the biblical imagery in this story. Now, Fred Rogers was actually a Presbyterian minister, so the idea of washing the feet, right, in the Bible, Jesus washes his disciples’ feet. Fred Rogers would have been very aware of what he was doing and what it looked like. JBM: You are absolutely right. And actually, François talks about this in his interview. It was not lost of François what these sort of spiritual overtones were. MG: And at the end, when Mister Rogers says to him, “I’ve been speaking to you this whole time.” I mean, I grew up watching Mister Rogers and that’s what watching the show felt like. JBM: Exactly. Every single kid felt like they were the only person watching that program. Mister Rogers was talking directly to me. And at the end, also, when you hear Mister Rogers say to François, “Do you have time to sing a song for my friend and me?” That gets me, because, I mean, I – that’s how I feel when I’m watching it, I know that’s how most kids felt. MG: So, the first time they did this scene was in 1969. And I think the context is really important. Because we’re at the tail end of the 1960s, and in the past year, Martin Luther King has been assassinated, and as François mentions in the piece, you know, the whole country has seen on TV and in the newspaper, images from Bloody Sunday, from Voting Rights demonstrations, from sit-ins. JBM: Yeah and it’s worth mentioning the significance, specifically of pools. I mean, swimming pools were famously segregated, and many protests took place around them. In fact, you know, when this scene aired in 1969, it was on the five year anniversary of a protest in St. Augustine, called a wade-in. And you know, whether or not Fred Rogers or François knew that is up for debate. You know, it could have just be a coincidence, but if it was intentional, it would have made what was already a powerful statement more so. MG: And you actually produced a story a couple of years ago about the St Augustine wade-in, and we’re going to hear that now. JBM: Yeah, so in June of 1964, J.T. Johnson and Al Lingo were two of several black and white protesters who jumped into the whites-only pool at a motel in St. Augustine. And at StoryCorps, these two came to talk about how the owner of the hotel tried to force them out by pouring acid into the pool. Al Lingo (AL): He really lost it. J.T. Johnson (JTJ): He did. Everybody was kind of caught off guard. JTJ: I tried to calm the gang down. I knew that there was too much water for that acid to do anything. Also knew we wasn’t gonna be in there long, that someone was gonna drag us out of there. When they drug us out in bathing suits and they carried us out to the jail, they wouldn’t feed me because they said I didn’t have on any clothes. I said, “Well that’s the way you locked me up!” But all of the news media were there because somehow I guess they’d gotten word that something was gonna happen at that pool that day. And I think that’s when President Johnson got the message. [Archival audio of President Johnson]: Our whole foreign policy and everything else could go to hell over this. Yesterday in the swimming pool in St. Augustine they started pouring acid in the pool. JBM: That’s J.T. Johnson and Al Lingo talking about trying to integrate a pool in St. Augustine, Florida, back in 1964. MG: So going back to François in “Mister Rogers’ Neighborhood,” another thing about the time and the context that we’re talking about, you know, the late sixties. It’s really a bold casting move to have an African American man play a police officer on your show. JBM: Right, and François was also gay, and he came out to Fred. So Fred knew this and Fred kept him on the show, which was, you know, kind of a big deal in the sixties. MG: So, it’s clear their friendship went way beyond their on-screen relationship. JBM: Yeah, they were really close, I mean, they spent holidays together,– Christmases, Thanksgivings. François had a really illustrious career outside of “Mister Rogers’ Neighborhood.” He was a professional opera singer, he won a Grammy in 1973, his love for old spirituals led him to found the Harlem Spiritual Ensemble. And you know, every time that François would debut somewhere, Mr. and Mrs. Rogers were sure to be there. MG: He was also an artist-in-residence at Middlebury College in Vermont for many, many years. And joining us now is another member of the production team here at StoryCorps, Cailey Cron. Cailey, you went to Middlebury? Cailey Cron (CC): Yes, I did. MG: What sort of figure did François cut on campus? JBM: Doesn’t he wear purple? All the time? Everyday? MG: Like, who were they? CC: The football players. You had some of the hockey bros. You know, you’d have these big, beefy guys next to, you know, like, the freshman chemistry major. And they’d be up on stage swaying back and forth singing. And it was a really surprising moment, one that I, I think only François could have pulled off. MG: And he retired in 2013 and you were there when that happened. CC: Yes. It was a little bit like Michael Jordan’s retirement, you know, François had this big concert and then he was back on campus afterwards. Shortly after that, I graduated and we had François come back to sing at our graduation. That’s something he’d done every year was to come and sing the alma mater for the graduating class. Before François could start the alma mater, a few members of my graduating class stood up in the audience and started singing, “This Little Light of Mine,” which they’d learned from being in spiritual choir with him. You know, more students started standing up, parents, faculty burst out into this rousing rendition. And François, at first, I think, was taken aback. But then, he jumped into the role that he was meant to be in and started leading the song. JBM: So he was the little light in Middlebury? CC: Absolutely, a big light. MG: So while we were working on the piece this week, you had the pleasure of getting to talk to him on the phone and email with him. What was that like for you? CC: It was great. I mean, he talked to me about life in Vermont, which I miss a lot, he talked to me about his dog, Her Royal Highness, Princess Nepal, who’s another important figure on campus, I would say. And the way that he signs off his emails, his tag line, I think is very emblematic of who he is, too,– Your writing, singing, acting, officer, diva man, etcetera, exclamation point. Ten exclamation points. MG: Well, Cailey, thanks so much for giving us a peek into François’ other neighborhood in Middlebury, Vermont. MG: And Jasmyn, thanks so much for bringing us these pieces. MG: That’s it for this episode of the StoryCorps podcast. The stories were produced by Jasmyn Belcher Morris with help from Andrés Cabellero. The podcast is produced by me and Elisheba Ittoop. Special thanks to Jane Klain, researcher at the Paley Center for Media, who helped us confirm that Officer Clemmons was indeed the first recurring role for an African American actor on a kids show. We’d also like to thank the Neighborhood Archive for helping us get the Mister Rogers audio you heard in this episode, and the Fred Rogers Company for sharing a really great photograph of Fred and François during the pool scene in 1993. Head to our website, StoryCorps dot org, to check it out. And there, you can also find out how to record your own interview. And one last thing, we have a favor to ask this week. It would be super helpful to us if you could write a review of this podcast on iTunes. See, the more reviews we get, the more people will find out about the podcast. It only takes a second and it be a huge help to us. For the StoryCorps podcast, I’m Michael Garofalo. Thanks for listening.